How does an air conditioner work? Air conditioners and refrigerators work the same way. Instead of cooling just the small, insulated space inside of a refrigerator, an air conditioner cools a room, a whole house, or an entire business. Air conditioners use chemicals that easily convert from a gas to a liquid and back again. This chemical is used to transfer heat from the air inside of a home to the outside air. The machine has three main parts. They are a compressor, a condenser and an evaporator. The compressor and condenser are usually located on the outside air portion of the air conditioner. The evaporator is located on the inside the house, sometimes as part of a furnace. That's the part that heats your house. The working fluid arrives at the compressor as a cool, low-pressure gas. The compressor squeezes the fluid. This packs the molecule of the fluid closer together. The closer the molecules are together, the high its energy and its temperature. The working fluid leaves the compressor as a hot, high pressure gas and flows into the condenser. If you looked at the air conditioner part outside a house, look for the part that has metal fins all around. The fins act just like a radiator in a car and helps the heat go away, or dissipate, more quickly. When the working fluid leaves the condenser, its temperature is much cooler and it has changed from a gas to a liquid under high pressure. The liquid goes into the evaporator through a very tiny, narrow hole. On the other side, the liquid's pressure drops. When it does it begins to evaporate into a gas. As the liquid changes to gas and evaporates, it extracts heat from the air around it. The heat in the air is needed to separate the molecules of the fluid from a liquid to a gas. The evaporator also has metal fins to help in exchange the thermal energy with the surrounding air. By the time the working fluid leaves the evaporator, it is a cool, low pressure gas. It then returns to the compressor to begin its trip all over again. Connected to the evaporator is a fan that circulates the air inside the house to blow across the evaporator fins. Hot air is lighter than cold air, so the hot air in the room rises to the top of a room. There is a vent there where air is sucked into the air conditioner and goes down ducts. The hot air is used to cool the gas in the evaporator. As the heat is removed from the air, the air is cooled. It is then blown into the house through other ducts usually at the floor level. This continues over and over and over until the room reaches the temperature you want the room cooled to. The thermostat senses that the temperature has reached the right setting and turns off the air conditioner. As the room warms up, the thermostat turns the air conditioner back on until the room reaches the temperature. What about Heat Pumps? Imagine that you took an air conditioner and flipped it around so that the hot coils were on the inside and the cold coils were on the outside. Then you would have a heater. It turns out that this heater works extremely well. Rather than burning a fuel, what it is doing is "moving heat." 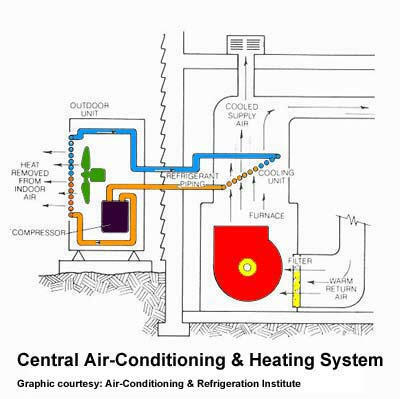 A heat pump is an air conditioner that contains a valve that lets it switch between "air conditioner" and "heater." When the valve is switched one way, the heat pump acts like an air conditioner, and when it is switched the other way it reverses the flow of the liquid inside the heat pump and acts like a heater. Heat pumps can be extremely efficient in their use of energy. But one problem with most heat pumps is that the coils in the outside air collect ice. The heat pump has to melt this ice periodically, so it switches itself back to air conditioner mode to heat up the coils. To avoid pumping cold air into the house in air conditioner mode, the heat pump also lights up burners or electric strip heaters to heat the cold air that the air conditioner is pumping out. Once the ice is melted, the heat pump switches back to heating mode and turns off the burners.